On April 9, 2015, the Indians lost the multi-pitcher effort on a 9th-inning one-out home run by the Houston Astros’ Jed Lowrie. Lowrie’s shot over the left-center field wall off Nick Hagadome ended the effort begun by Trevor Bauer (6), Kyle Crockett (1) and Scott Atchinson (1). The Indians held on for a 5-1, one-hit victory. The Indians’ last no-hitter was a perfect game by Len Barker nearly 35 years ago, marking a current drought second only to the San Diego Padres, who have never thrown a no-no. 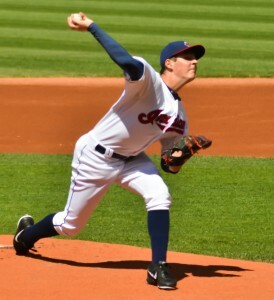 Barker on that day shut down the Toronto Blue Jays for a 3-0 win at Cleveland Stadium.